The upcoming wine dinner for Sicily is priced at $99 per guest, $55 for wine pairings. The Cal-Italian finale can be reserved with a ten-guest minimum and is priced at $499 per guest, all-inclusive of menus, wines, taxes and gratuity. Each selected chef was tasked with creating five original dishes using all parts of a Heritage pig. The winner was decided by a team of 20 judges and the votes of the 400 pork-loving attendees. The winning Los Angeles team now moves on to the National Finals in Aspen on June 16th as part of the celebrated Aspen Food & Wine Classic. Jet will share his ringside observations on the competition. Chef Jenn Stoker is a Chicago-based personal chef and graduate of the prestigious Culinary Institute of America in Hyde Park. Along the way she has perfected some fun recipes and interesting relationships. She has put all of this into her book, She Cooks, She Scores: A Satisfying Collection of Tastes and Tales. Perceptive journalist and veteran editor Kedric Francis has been on the Orange County scene for seventeen years. He is currently the Executive Editor of Coast (monthly) as well as the co-founding editor of the new OC Register Magazine. Previously he was the founding editor-in-chief of Riviera as well as Riviera San Diego. Kedric is going to share his perspective on the dining out scene in Orange County as compared to dining out in Los Angeles County. He’s also discussing the differences he notes in restaurant criticism in each area. It’s voting time for the best restaurants section in the OC Register’s annual Best of OC publication. Reader/public voting is on now through the end of May. Many of you may remember the name Vic Vegas from a recent season of the popular Food Network series, Food Network Star. Vic originally looked like a weird MMA fighter turned chef, but it turned out he’s really a Mama’s Boy from Jersey with some great Italian recipes. Fast forward two years, and now Vic has his own restaurant, aptly titled Vic’s, in the Las Vegas suburb of Anthem, Nevada. It’s only been open two months and it already has a great following. Vic will share his experiences of opening the new restaurant, what’s on the menu and what he thinks about the upcoming season of Food Network Star, about to hit the airwaves in just a couple of weeks. New Orleans native, Chef Brandon Boudet, is the co-owner of Dominick’s, Little Dom’s and Tom Bergin’s. On Saturday, May 18th and May 25th from Noon to 4:00 p.n. Chef Boudet is holding his 4th Annual Crawfish Boil on the patio at Dominick’s. It’s 300 pounds of fresh Louisiana crawfish cooked at each event! It’s a real taste of New Orleans in Los Angeles! Also on the menu are Boudet’s New Orleans specialties including Po’ Boys and Crawfish Boiled Artichokes with Remoulade. For dessert there are New Orleans Sno Balls. Luciano has been the guiding force behind Piero Selvaggio’s Valentino Las Vegas since it opened 14 years ago. He relocated from Los Angeles and has very visibly been at the helm ever since. He’s one of the few James Beard award-winning chefs who actually cooks in a Las Vegas restaurant full-time and lives there! Unfortunately we missed connecting with Chef Luciano and hope to talk with him at another time. The Valentino news is that the restaurant will be closing at The Venetian with the hope it will soon be transplanted to a new location. The better news is that Chef Luciano and his fine staff will be serving guests until the end of June if not longer. Enjoy the original Valentino Las Vegas experience while you can. When it comes to elegant Italian fine-dining with exemplary service and a superb wine program you really can’t do better! Travel Channel’s Andrew Zimmern is a fan of Chef Jet’s food and has been wanting to cook with him on TV for some time. It finally happened on February 17th when Andrew visited Jet at The Charleston in Santa Monica for their Sunday Jazz Brunch. Jet demonstrated two dishes for Andrew Zimmern for a new Web series Andrew has on MSN. The series goes by the name “Appetite for Life”. If you go to the Web site, you’ll see a big window on the Home page with color photo links to the Season 5 episodes. If you tab through the 16 episodes presented there (right and left) Jet is Number 5. The webisode itself is titled “A World of Culinary Wisdom”. We’re very international this week. It’s a dash of Morocco with an insight on the world of secret dining. Then we talk juicy burgers followed by a touch of elegant dining in Las Vegas. Finally it’s a taste of India in our own backyard. First it’s the “best bite of the week” with Chef Jet and Producer Andy. Thereafter it’s Zov of Zov’s Bistro in Tustin previewing her upcoming author lunch with Kitty Morse. Ms. Morse is a native of Morocco and returns there often. Her latest title is, Mint Tea and Minarets: A Banquet of Moroccan Memories. It’s un-American not to appreciate a juicy hamburger hot off the grill.Television host, author, Emmy award-winning filmmaker, and burger expert, George Motz certainly agrees. His passion for burgers initially resulted in the award-winning documentary, “Hamburger America.” The success of the film inspired George to then pen a state-by-state guide to burgers also titled Hamburger America. Now George has an original series for Travel Channel, “Burger Land”. George takes the views on a road trip across America offering his expert take on the nation’s top burgers in various regions of the country. The first city visited is Los Angeles and it’s more than the obvious spots! 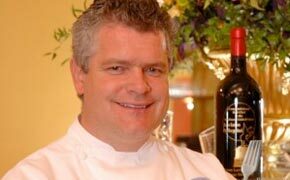 Luciano Pellegrini is the founding executive chef at Valentino Las Vegas located in The Venetian hotel. For 14 years this fine Italian restaurant has been earning rave reviews. Chef Luciano is one of the few James Beard award-winning chefs who actually lives in Las Vegas and cooks in his restaurant. He won his coveted Beard Award for Valentino Las Vegas! Chef Luciano will be sharing some Valentino Las Vegas news. Linda Burum is an accomplished food journalist known for her attention to the details. You’ve seen her engaging work in Los Angeles Magazine, The Los Angeles Times and LA Weekly. Among the cuisines that Linda has extensively researched are the regional cuisines of India. Linda will be sharing her food knowledge of our own Little India on Pioneer Blvd. in Artesia. Very few fine dining restaurants in Los Angeles survive for 5 years so an establishment which is celebrating 40 years of success under the same ownership is real news! Such is the case with Valentino in Santa Monica under the watchful eye of L.A.’s consummate and most gracious host, Piero Selvaggio. Unbelievably after 40 years Piero still can’t wait for the doors to open nightly at Valentino so he can greet and seat his loyal guests. That’s the art of hospitality. Valentino’s remarkable wine cellar is known and respected internationally. It’s one of the most comprehensive in the United States with some 1,200 selections and 70,000 bottles! November 14th is the “Forty Years, Forty Dishes and Forty Wines at Valentino” Anniversary Dinner. Executive Chef Nico Chessa and Pastry Chef Allessandro Stroppa will collaborate with guest chefs Celestino Drago and Steve Samson. The menu of 40 courses and 40 wines (small bites and 2 oz. wine pours) will be inspired by the cuisine of Sicily’s most revered chef, Ciccio Sultano, to commemorate the 40 years of Valentino and the dishes of Sardinia and Sicily, Piero’s birthplace. December 4th is the “Valentino 40th Anniversary While Truffle Dinner and Celebration.” The evening features Walter Ferretto of the multi-starred Cascinale Nuovo in Asti, Piedmonte along with Valentino alumni chefs Luciano Pellegrini, Angolo Auriana, Davide Giova and Valentino Executive Chef Nico Chessa and Pastry Chef Alessandro Stroppa. This ultimate white truffle dinner with 10 courses includes a course with white truffles freshly harvested the night before and hand carried by Ferretto from Asti. The menu will feature signature dishes from the history of Valentino created by the alumni chefs.